Sossusvlei is the Southern Regions’ most popular tourist attraction and forms part of the Namib Sand Sea World Heritage Site and is located in the Namib Naukluft Park. 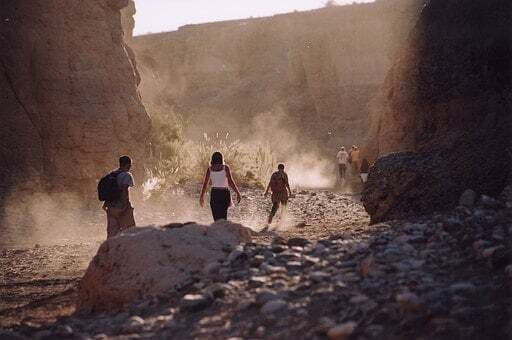 The entrance is at Sesriem and visitors must drive a further 66 km’s along to reach Sossusvlei and are only allowed access between sunrise and sunset. The road from Sesriem to Sossusvlei is tarred and a 4×2 can be used to get there. The last 6 km’s however can only be done by 4×4 as it is very sandy. Some people prefer to walk the last few km’s or one can make use of the 4×4 transfer service. Permits are required to view Sossusvlei and can be obtained from the office in Sesriem. The best time of the day to visit Sossusvlei is either early in the morning or late in the afternoon. The rising and setting sun enhances the colours of the surrounding dunes and offers many good photographic opportunities. The heat at midday is intense. 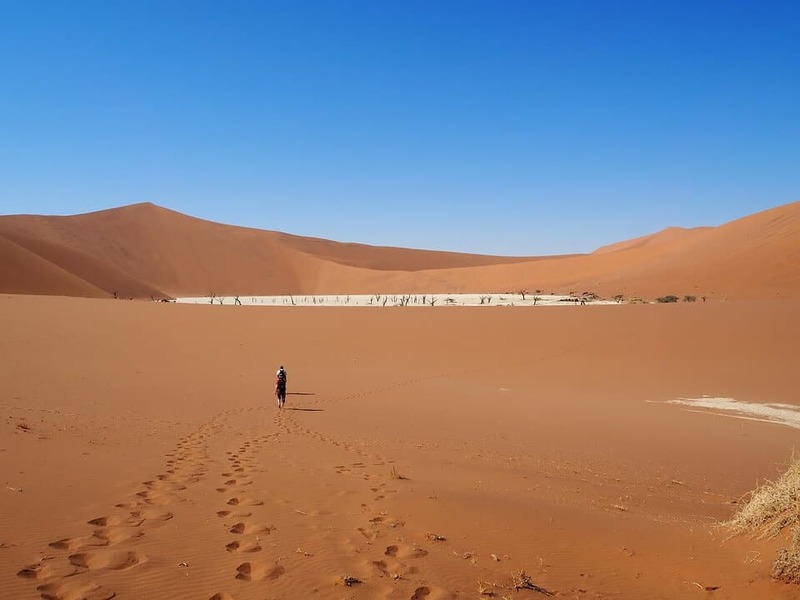 The name ‘Sossusvlei’ is of mixed origin and roughly means “dead-end marsh”. Vlei is the Afrikaans word for “marsh”, while “sossus” is Nama for “no return” or “dead end”. Sossusvlei owes this name to the fact that it is an endorheic drainage basin (a drainage basin without outflows) for the ephemeral Tsauchab River. It is worthwhile getting a map of Sossusvlei so that one knows where the various popular dunes are located. 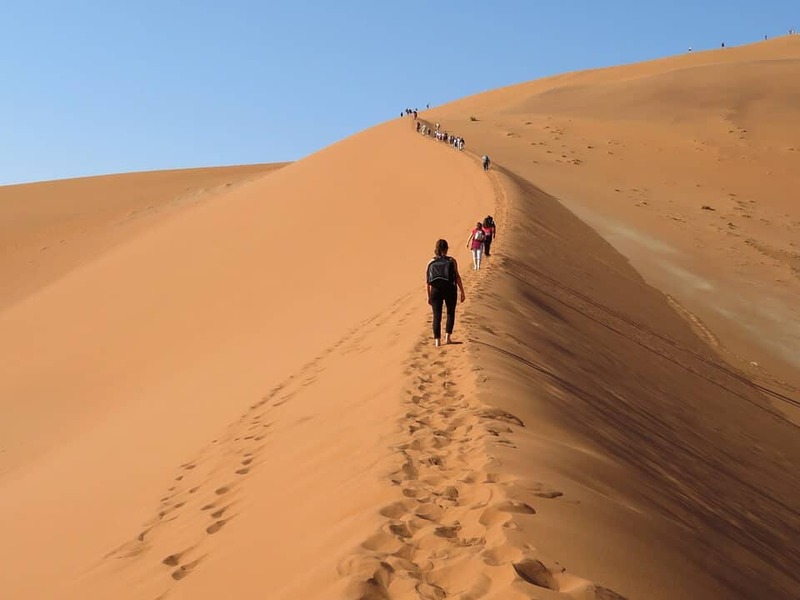 Many tourists want to experience climbing one of the massive dunes in this area. The view from the top of one of these high dunes is breath taking and one very quickly realises that the term Namib Sand Sea is a very apt description. ‘Other-worldly’ is an expression that has also often been used by visitors to this area. This desert area is believed to have some of the highest sand dunes in the world with the highest reaching 340 meters high and known as Big Daddy. Dune 7 just outside of Walvis Bay at approximately 385 meters high is however considered to be the highest dune in the Namib Desert. Sossusvlei is a clay pan, of roughly elliptical shape, covered in a crust of salt-rich sand. While the pan has been shaped over time by the Tsauchab River, the actual flooding of the pan is a relatively rare event, and sometimes several years pass between one flood and the next one. The river is dry most of the year, and even when it is not, it carries relatively little water to the vlei. The Dead Vlei is another clay pan, about 2 km from Sossusvlei. A notable feature of the Dead Vlei is that it used to be an oasis with several acacia trees and afterwards the river that watered the oasis changed its course. The pan is thus punctuated by blackened, dead acacia trees (estimated to be between 500 to 600 million years old), in vivid contrast to the shiny white of the salty floor of the pan and the intense orange of the dunes. Tourists are able to view the area by hot air balloon. A scenic flight is also a popular way of seeing this beautiful area from the sky. Sesriem Canyon: located about 4 km’s from the Sesriem camp site and main conservation office. It is considered the second most popular attraction in this area after Sossusvlei. The Sesriem Canyon is a natural canyon carved out by the Tsauchab River and is about 1 kilometre in length, up to 30 meters deep and only two meters wide in some places. Most of the time it is possible to walk through the canyon unless it has rained recently when large pools of water are formed and may block you. This however does not happen very often. The name ‘Sesriem’ is Afrikaans and translated into English means ‘six belts’. This name was given by settlers from the Dorsland Trekkers and refers to the number of belts that had to be tied together in order for the bucket to reach the bottom of the canyon and scoop up water. Elim Dune: approximately 5 km’s past the Sesriem Gate driving towards Sossusvlei Elim Dune is located to the right. It is a high dune and relatively isolated. The name originates from one of the old farms that used to be found in this area. 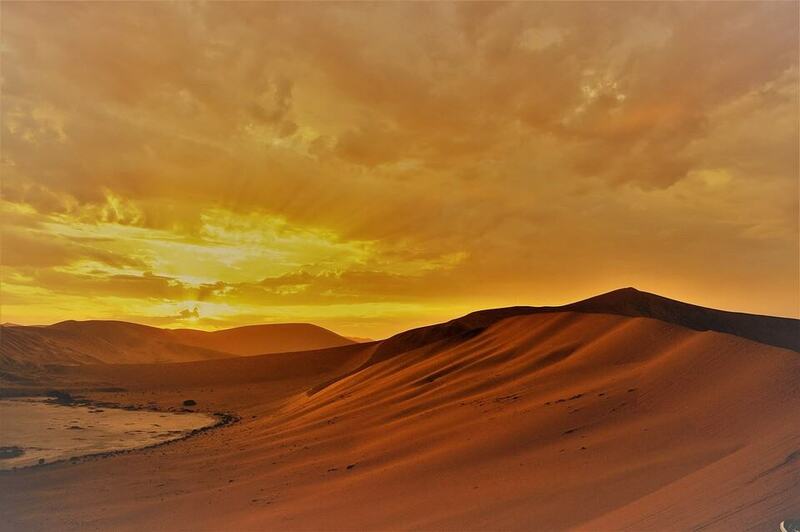 Big Daddy: Big Daddy is considered to be the highest dune in the Sossusvlei area at approximately 340 meters high. The views from the top are spectacular and make the climb up well worth it. Tip: never try to climb up the side of a dune, rather climb up the spine of it. Big Daddy is located past Sossusvlei near the Deadvlei. It faces another very high dune known as ‘Big Mama’. 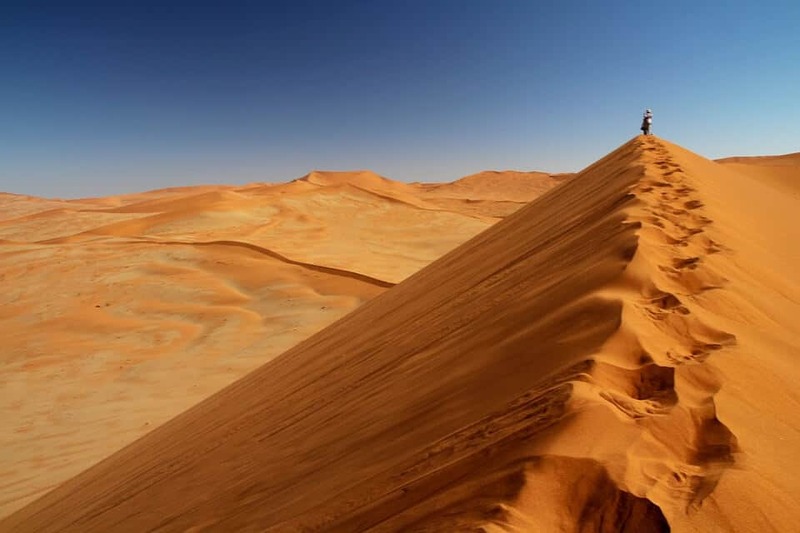 Dune 45: This dune is called dune 45 because it is located 45 km’s from the Sesriem Gate en route to Sossusvlei. It is not as high as the other dunes and is about 85 meters high. It is believed that the sand that makes up this dune is approximately 5 million years old. It is also very popular for tourists to climb. Deadvlei: The Deadvlei is another clay pan about 2 km’s from Sossusvlei. The Deadvlei is a very surrealistic and interesting area and visitors to this area have often said that they felt as if they were on another planet. This vlei used to be an oasis until the river change its course over many years leaving the acacia trees to die and blacken and harden under the blazing African sun. These dead trees are surrounded by bright orange dunes which contrast with the white salty pan. It is one of the most photographed attractions in Namibia. Hiddenvlei: this vlei is the least visited and is located about 4 km’s from the 4×2 parking area. It is however still worth a visit if you want to avoid the crowds.